Dust mites are a big problem for allergy sufferers and asthmatics. According to a recent Australian Study, 60% of an average persons exposure to dust mites is within the home and the other 40% outside the home. According to ehso.com, every yard (0.91 metres) of carpet can contain up to 100,000 dust mites. Unlike ordinary dust, they can be difficult to clean, in severe cases, it’s likely you will need a professional domestic cleaning company to assist with keeping them under control. Dust mites are tiny creatures that thrive in hot and humid areas. The small size makes them invisible to the naked eye, and this is why most people don’t realize their presence in the home. They feed on the dead moldy skin cells of humans or pets skin. Dust mites thrive in areas of the home that have a poor circulation of air or next to areas where mold is likely to grow. Dust mites thrive in wet areas, so you are likely to find them hidden in damp areas of the home. The most common areas include the carpets because they are likely to accumulate moisture. You are also likely to find dust mites in bedding and upholstery furniture if you don’t allow them to dry well after cleaning. Curtains and stuffed animals are also common areas where you will find the accumulation of dust mites. Remember to also check lamp shades and wet walls in the home because these are also common hiding areas. Dust mites are known to cause many health problems in the home. They cause allergic reactions that cause both respiratory and skin complications. Some of the respiratory complication caused by dust mites include; running nose, sneezing, coughing, and breathing difficult. Skin allergies include; infected eczema, red and itching bumps on the skin. This will be especially true if your skin is sensitive and you come into skin contact with the dust mites. How do dust mites cause allergies? 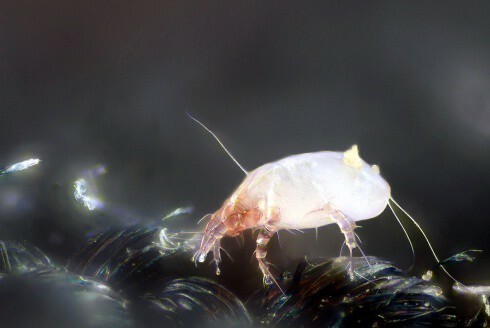 Dust mites trigger allergic reactions due to their waste. This is why the solution is never killing the dust mites alone but cleaning the whole area to get rid of the waste. The waste produced by the mites contains allergens that attack the immune system once inhaled. Inhaling the waste in the form of dust triggers the immune system to fight back the allergens. This is why you are likely to experience various symptoms like coughing, sneezing, running nose and watery eyes as the immune tries fight back. Dust mites are tiny, and this means that cleaning house with dust mites is always a challenge especially if you have an allergy. The first step is to make sure that you concentrate in cleaning the areas where they hide. Remove bedding, pillows, curtains and rugs in the home and hang them outside as it’s possible to dry out the dust mites in the sun. Use a damp micro-fibre cloth instead of a duster to go over all the hard surfaces in the home to avoid dust from flying into the air. Remember to take out young kids and pets to avoid an allergic reaction from the dust. The process of reducing dust mites involves activities that are done every day to help in dealing with the problem in the long run. Try and practice regular house cleaning habits like cleaning beddings every week and vacuuming at least twice every week. To further solve the problem of dust mites in the bedroom you can opt to buy allergen bed covers that further protect your bed from dust mites. It is also important to keep your home well ventilated because too much humidity encourages the growth of mold that acts as food for the dust mites. As mentioned above, putting items in the sun can be very effective in killing dust mites, be careful with using harsh pesticides especially around children. In our opinion, the safest and usually the most effective way of killing dust mites is by getting professionals to steam clean your carpets and upholstery. Killing dust mites is an ongoing process so don’t be discouraged if you are not able to kill all the dust mites in one go.